Visitors to the museum are taken back in time…through the various cottages and artefacts they can experience how crofters lived and work on the Island. As one enters the croft house (the largest in the group) the room to the right is the kitchen and here the family cooked, ate and sat. It was the main room in the house. 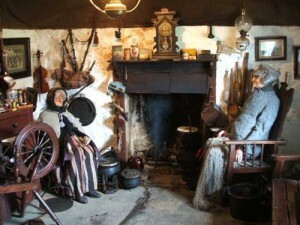 All the cooking was done on the peat fire which burned day and night, summer and winter on the open hearth. Heavy pots of cast iron were used and the three-legged pot was often to be suspended over the flame by means of the ‘swee’. The cruise, a lamp burning fish liver oil, was used before paraffin lamps became common. All the crockery in the home was displayed on the shelves of the dresser and it was customary to display coronation memorabilia, etc., on a prominent shelf. The furniture consisted mainly of a bench or settle, a table, a barrel chair by the fireside for the ‘man of the house’ and another two or three chairs or stools for the family or the visitor. On a mantelpiece one could always find a Gaelic bible and a family photograph if such was available. No Highland cottage was complete without a set of bagpipes, a fiddle or a Jew’s harp. These items were indeed necessities, as crofting families had to depend entirely on their own resources for winter entertainment. The father was often able to teach his sons the art of playing some instrument, and how better could one pass a winter evening than in the happy atmosphere of Gaelic songs, music and discussion around a cosy peat fire? There can be few parts of the world, if any, which have such a wide and varied culture as the Highlands and Islands of Scotland; and in our language, song and music we have a great deal of which to be proud. In the middle of the house and leading off the kitchen is the parents’ bedroom, containing an old-fashioned box bed. The mattress is filled with straw as was customary in days of old. The linen sheets are all hand-made, as are the blankets which have been spun and woven in a local croft house. Another unusual exhibit is the curtain which drapes the bed. The flax for this was locally grown and the coarse linen woven by hand, some two hundred years ago. The strong crimson colour was derived from a certain type of lichen from the rocks nearby. 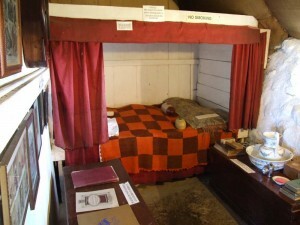 The larger bedroom which originally was the children’s room contained three box beds. The remainder of the bedroom furniture was utilitarian and unembellished. There were wooden chests for clothing, a basin for washing, a mirror and a candle. As in the kitchen, the walls were white washed and the ceiling lined with hessian which was prepared or whitewashed. In 1933 the Duke and Duchess of York visited Skye and during their visit they were taken to many places of interest. At that time there were many thatched houses to be found throughout the island, and naturally, the Royal visitors were impressed with their smart appearance and the ingenuity and skill of the crofters who were able to build for themselves houses were so functional and blended in so well with the environment. The house which is now the main house in the group was the one chosen for a Royal party visit, and it is therefore considered likely that it is the only croft house on the island to have the distinction of having being visited by a couple who were later to become the much loved and respected King and Queen of Great Britain and the Commonwealth. The agricultural system of Skye is crofting, and a ‘croft’ means a small-holding or a piece of land ranging in size from one or two acres to fifty acres and upwards. There are almost two thousand crofts on Skye but only a hundred or so are large enough to allow the ‘crofter’ to earn his livelihood from the land. The majority of crofts today provide a family home and a sideline to whatever job the crofter can obtain. Sheep and cattle are reared on the croft land, and since the beginning of the century very substantial improvements have been made in croft houses. 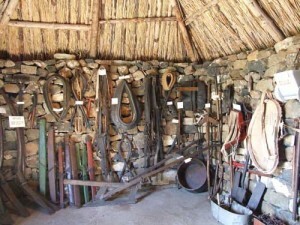 Until the middle of the century, work on the land was carried out by the use of horses and by hand tools and implements. 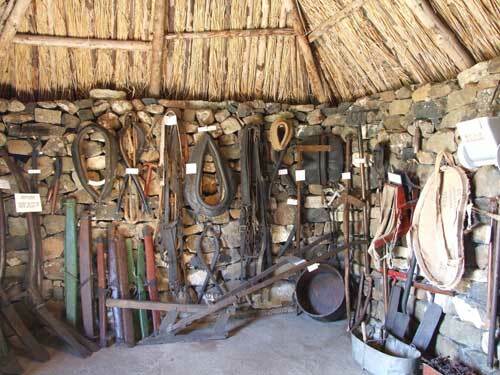 In the barn there is a very comprehensive display of such tools and implements, many of which are one or two hundred years old , and which were often made by the crofter himself or by the blacksmith in the local smithy. This small cottage could often be seen as a very busy workshop. The village weaver could always find plenty of work to keep his shuttle going, as he produced not only the tweed for all types of garments but also the blankets and plaids. The old handloom on display here is over one hundred years old and is typical of the type used in homes of the Highlands before the automatic looms were introduced. Other wool-working instruments on display here include a distaff which goes back over two hundred years. This ancient piece of wood was used by the women along with a spindle – to spin yarn in the times before spinning wheels became available. This method of spinning was employed by the wives, as they walked to the moor for peat or as they moved about herding cattle in the long summer evenings. 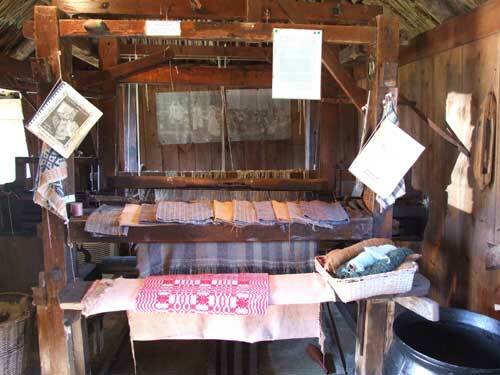 Items such as a hank-cross, carders and dyepots can also be seen here along with old dye-making recipes. There are three types of spinning wheel on display, but the medium sized one called the Saxony wheel was the one most commonly used in the Islands. A smithy could be found in every community in the past, but today, alas! It’s function is no longer required in rural crofting areas as mechanisation has long since taken over from the good and faithful workhorse. 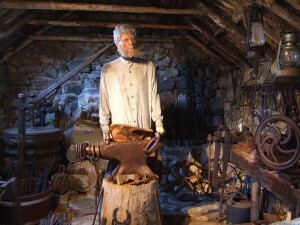 The smithy was a very popular meeting place for the local folk – young and old alike. The smith was never to be found alone, and all the happenings of the place were discussed in his hearing by those who called in. In the Islands, farriery was the mainstay of the smith’s income. Every crofter had a horse, or sometimes two, and in the busy seasons of spring and summer there was always a horse in the smithy being shod. 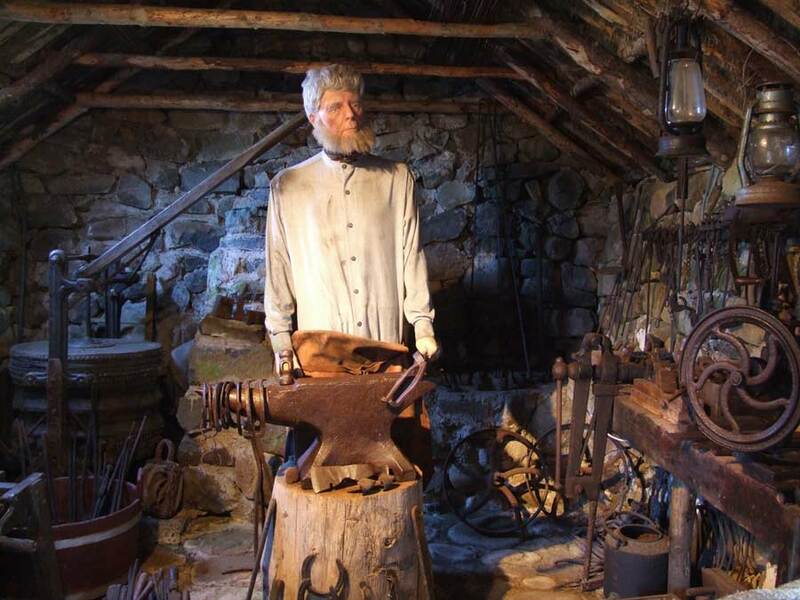 In winter the smith was never idle and was always at his anvil making horseshoes or mending the many various items sent to him for repair. 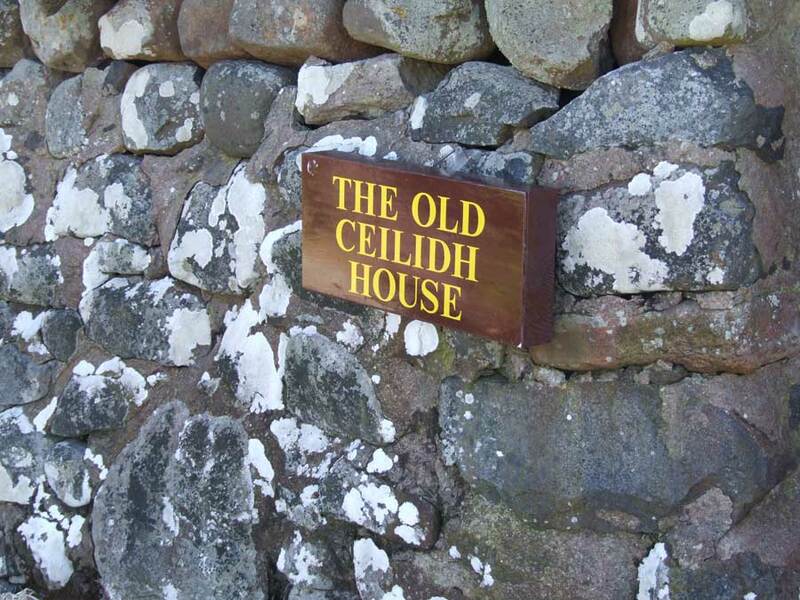 The word Ceilidh in Gaelic means a small homely gathering of friends. In the days before the arrival of radio and television, it was customary for neighbours to meet together in the long winter evenings and to make their own entertainment. Songs were sung, stories were told and discussion on many and varied topics took place. Young and old engaged in the congenial proceedings, and as they sat happily around the peat fire the long dark night soon wore away, leaving with each and all a sense of the close community spirit and atmosphere that was once so characteristic of the islands of the Hebrides. 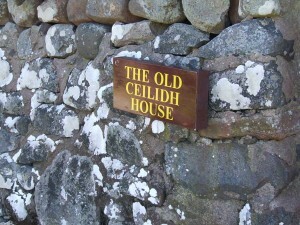 This old ‘ceilidh house’ contains many old documents and photographs of Skye.